Sean and Mittie agreed to let us use their car – the Fat Rabbit – while they go off to be professors at a university in the jungles of Oaxaca. We haven’t really needed a car, but we are Americans, so not having a car is a bit like not wearing pants; when you leave the house, something doesn’t feel right but you just can’t put your finger on it. And we’ll say, “We’re going to the grocery store.” And then Poppy will say something like, “Cool.” And that will be that. So, we got this car – the Fat Rabbit. Because we’ve been so busy though, I couldn’t pick the car up until a few days after Sean and Mittie left town. They left it parked by their house and I had to walk there to get it. When I arrived, I was surprised to see a black garbage bag placed over the place where the driver side window would be. And there was no window. The side view mirror was also gone, but I kind of remembered that from being driven around in the Fat Rabbit when we were in SMA in summer of 2016. But I was surprised about the window. Not having a driver side window is something I felt like the professors would have mentioned in the conversation where we talked about borrowing their car. Well, it hardly ever rains here so maybe they didn’t think it was that big a deal. When I tried to start the car though, nothing happened. Not even a click, click, click. I got out and took a look under the hood and saw that the car battery was missing. I had heard that stealing car batteries was kind of a thing in Mexico, so I looked in the trunk. I thought that since the window was gone Sean and Mittie might put the battery in the trunk to prevent it from being stolen by someone reaching into the car, popping the hood, and having themselves access to a free battery. That might seem a little crazy, a little bit like a long shot, but hey, you never know. When you live in Mexico you have to think outside the box. After Sean and Mittie entrusted us with the keys to the Fat Rabbit, the battery went missing. Anyway, as you might have guessed, the battery wasn’t in the trunk. I looked in the back seat but didn’t really expect to see the battery and I didn't. I didn't see anything except the back seat of a car. Since there was nothing I could do, and since I had to be at the Deportiva to play soccer, I put the bag over the window just in case it did rain and walked away. The next morning, I beat my friend Ben at tennis 6 games to 4. Ben considered that a victory and made me buy him coffee. While I sipped my Americano Grande negra and Ben enjoyed his latte, I told him about the Fat Rabbit. He called his mechanic. His mechanic was out of town and couldn’t help so we went to Auto Zone and I purchased a new battery for a 1998 Honda Accord for 1,600 pesos (about US$90), which included a 250 peso core charge. A core charge is like a deposit that you get back when you bring the old battery in for recycling or whatever they do with it. Ben and I then went to the Fat Rabbit and Ben noticed that the car window wasn’t broken or missing but it was just rolled down. I hadn’t noticed this and it partially solved a few somethings that had been bothering me. First, why didn’t Sean and Mittie mention the window? Answer – because there was nothing to mention. There was nothing wrong with it. Second, if there was nothing wrong with it, why was it down? Had someone broken it so they could get the battery? If so, why wasn’t there any glass? Did the thief break the window, sweep up the glass so that not a shard remained, then take the battery? Not likely. It made a lot more sense that Sean just forgot to roll up the window before he walked away. And then someone came along and helped themselves to the battery. But if that was the case, there was still one more mystery – who put the bag over the window? After the discovery about the window, Ben and I muscled the battery into place but connected the wires incorrectly so we got a shower of sparks that melted one of the terminals. Not too badly, but enough so that you noticed. Once we got the battery connected the right way, the car alarm went off and wouldn’t stop. This alerted the neighbors, and Javier came out to watch. Javier owns a tienda near Sean and Mittie. A tienda is a small convenience store. It is usually operated from the front of someone's house and sells junk food and soda, but sometimes also sells fruit, vegetables, bread, SIM cards for cell phones, pet food, mops, yogurt, beer, and bacon. You can find a tienda on almost every street in Mexico. Javier's tienda sold all of these things except beer and mops. We used to go to Javier's tienda when we stayed with Sean and Mittie in 2016. Mostly we would buy bacon once or twice a week, but J used to go there almost every day and buy a raspado as well. Raspados are like slurpees. 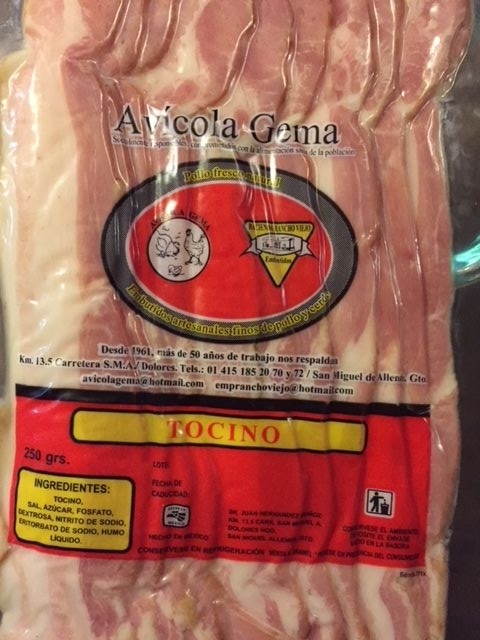 I stopped by Javier’s tienda one time since we’ve been back in SMA to buy bacon (R really likes his bacon!) and we chatted for a few minutes. He remembered me. When I was ready to pay for the bacon, Javier said it was one million dollars. Then I remembered he always did that, no matter what you bought. He says it is one million dollars. It doesn’t really cost that much, but that’s Javier’s little joke. I think that is the only thing he can say in English. We really like this million dollar bacon. While Ben connected and disconnected the battery I walked around the Fat Rabbit and Javier suggested things I could do to stop the alarm from sounding. None of them worked. Then Javier told me he had the battery that had been in the car in his tienda. I’m not sure why he waited for several minutes to tell me he had the battery, but whatever. Sure enough, when he came out of his store he was holding a dusty battery that fit perfectly in the Fat Rabbit. We connected the terminals and Javier suggested I put the key in the driver door lock and that stopped the car alarm. I started the car and rolled the window up and rolled it back down again because the Fat Rabbit was parked in the sun and it was hot inside even though the window had been rolled down. Now that winter is over, it’s been consistently in the 70’s and 80’s during the day. With the mystery of the Fat Rabbit solved – Sean forgot to roll up the window; Javier had taken the battery, presumably for protection rather than with evil intent, and put the bag over the window to prevent weather-related mishaps and also to place some barrier between the inside of the Rabbit and thieving hands – I gave Javier 200 pesos for his trouble, put the battery that I had just bought that now had a melted terminal in the trunk, thanked Ben, and drove away. I decided to ignore the check engine light, the low tire pressure light, and all the other lights that lit the dashboard like a Christmas tree, for the time being. Since I couldn’t return the battery to Auto Zone because it wasn’t like new anymore, I figured I would just have to eat the cost and deal with looking at it sitting on my living room floor for the foreseeable future. But, one night a few weeks later, while I was parking the Rabbit after having taken Coconut and her friend rock climbing, a guy standing on the corner told me he was having car trouble. I have no idea why he told me this, but I told him if he needed a new battery I could sell him one. He said he did need a new battery, so we went to the house and R explained why we happened to have a car battery in our living room and why the terminal was slightly melted. He seemed to understand the situation and offered 1,000 pesos for the battery, which I accepted. We went back to his truck and managed to hook the battery up even though we didn’t have the right tools and then he drove away. Now I’ve got his old battery sitting on my living room floor, waiting for me to bring it to Auto Zone to recover my 250 peso core charge. We really like this tequila. After all this happened, I was reading a guide book about Playa del Carmen and there was a foreword by Sammy Hagar. If you don't know, Sammy Hagar has been coming to Mexico for 30 years and owns a home and bar in Cabo San Lucas. He also has some stake in a tequila named Cabo Wabo, which I recommend. Anyway, the foreword made me think about the Fat Rabbit. Sammy writes that one of the reasons he loves Mexico is that each day brings a sense of discovery, of new faces, and plenty of surprises. While I don't love everything that Sammy has written, this is one lyric that hits it right on the mark. There isn't much in the mystery of the Fat Rabbit that is likely to have happened in the States, but here, it just doesn't seem that extraordinary. And that's why we love Mexico. Rather than leading a life that was trending too much to the routine, we can revel again in life as a mysterious adventure. So, that's the story. And here are a few questions you can ponder. Question 1: Why didn't Professor Sean put up the driver's side car window after he parked? A. He didn't want to pay to have the engine repaired and was hoping the car would get stolen. B. He forgot because he was preoccupied with last minute packing details, how to teach his class the correct pronunciation of "tomato", and whatever else a young man in the prime of his life spends his time thinking about, which is not, apparently, putting up the car window. C. He was high as a kite. Question 2: What was Javier's intention when he removed the car battery? A. He wanted a car battery. B. He wanted to be a good neighbor, but didn't want to knock on the Professor's door to let them know they left the window open because he knew they were busy packing. Instead, he removed the battery to prevent others with more sinister intentions from doing the same. And then he forgot to leave a note in the car letting anyone know he had done so. Question 3: Why would Paul possibly think that the battery thieves would sweep up the glass of the window they just broke? A. He doesn't speak Spanish very well, therefore, he doesn't think Spanish very well. B. Everyone in San Miguel that he has met has been very polite and it just seemed possible that someone who would steal your car battery might also be concerned about leaving broken glass in your car and on the sidewalk. C. He can be pretty dumb sometimes. Correct Answer - All of the above. A. You would happen to have a car battery in your living room and a man standing on a street corner would buy it from you. B. You would buy bacon from a convenience store. C. Your mechanic would answer his phone on a Sunday.